MyThoughts 1.2.1 (Mac App Store link) is a mind-mapping application that helps you to create visually appealing mind maps that can include images, Web links, or links to audio, video or other types of files stored on your Mac. But while the application gives you the freedom to create interesting-looking mind maps, it lacks the template and outline-to-mind-map options available with other, similar programs. The principle behind mind mapping is simple. Instead of corralling yourself with the limitations and seeming formality of a standard outline, mind maps allow you to brainstorm an idea, getting all your thoughts out on the page in a way that is linked, but not necessarily sequential. Once your brainstorming session is complete you can then go back and rearrange and reorganize your broad and far-reaching ideas into something more coherent and sequential. 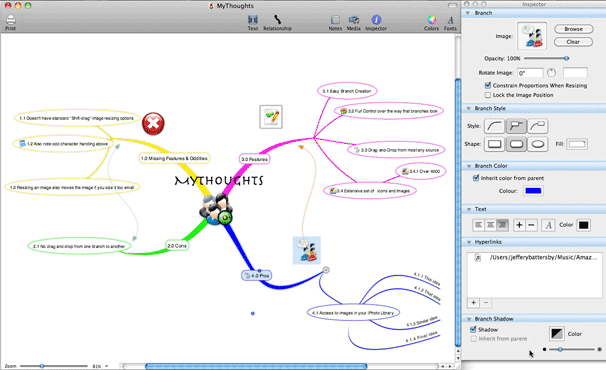 MyThoughts handles the creation of mind maps in much the same way as similar apps such as Mindjet MindManager and MatchWare’s MindView. Every new document you create starts with a single bubble in the center titled Thought. Double-clicking the title makes the text editable. To create new branches you either click a small plus sign that appears on either side of the initial bubble or, with the bubble selected, you type command-right arrow on your keyboard. As you do this, a new branch appears with the text field selected, ready for you to enter your new idea. I found this process easy to master, but not nearly as comfortable to use as MindManger’s command-return and shift-return keyboard commands for performing the same tasks. A beautiful mind: MyThoughts helps you quickly get your thoughts down and then lets you take those thoughts and turn them into incredibly creative maps. Once your basic map is created you can drag branches to different locations around your main idea, but I was surprised to discover that there was no way to drag a branch from one part of your map to make it a sub-branch off of a different branch on your map. Instead, you have to select the branch you want to move, cut it using the Edit -> Cut menu, select the branch you want it to be added to and then select Edit -> Paste. This is certainly a workable solution, but lacks the ease that I’d like to see. One of the things that sets MyThoughts apart from other, similar apps is the control it gives over the shape of the branches in your map. Grab either of the two grab points on any branch and you can quickly change its curvature and length. Additionally, MyThoughts ships with over 4000 icons and images that can be placed anywhere you map and you can also add, web links, attach documents and other external files. While MyThoughts offers much in the way of line customization, it lacks the finesse and the depth of any of the other mind mapping apps I’ve used. There are no outlining tools, no templates, nothing to mark the status or priority of an item in your map. In short, nothing to push MyThoughts beyond being a tool with which you can create cool looking mind maps. MyThoughts is an interesting mind mapping tool that is fun to use and which makes it possible for you to create really interesting looking maps. But its lack the depth to make it a complete and powerful business tool for creating mind maps. While I like the application for the unique maps it creates, I’m more interested in seeing what the future holds for MyThoughts than I am in using it to create my own maps.